2018 ended very much in a minor key for the militants in the Donbas. When asked by journalists when Russia would get around to recognizing the two “national republics,” Russian Foreign Minister Sergei Lavrov made no bones about the fact that Moscow had no intention of recognizing DNR and LNR, let alone uniting them. This means that only two options remain for ORDiLO: to return to Ukraine or to continue to rot as unrecognized territories. The second option pretty well precludes any kind of growth or development. Lavrov’s unambiguous statement was no surprise. Similar statements have come from Moscow time and again in the last four years, so that far fewer people living in occupied Donbas believe that they will join Russia than did in 2014. But plenty still do. And for such naive individuals, the Kremlin’s categorical position was a real slap in the face: unpleasant and offensive. So the supporters of the two republics are starting the new year with the unpleasant realization that nobody in Russia needs or wants them, and a “happy return to the family fold” like Crimea is not going to happen. As time goes on, the prospects for the two pseudo-republics to continue is becoming less and less appealing. In the second half of 2018, the economic situation in ORDiLO grew noticeably worse. This was especially true in the territory controlled by DNR. After the assassination of separatist leader Oleksandr Zakharchenko and the sweeping out of his circle, control of Donetsk went to the Denys Pushylin group. However, these people proved even less capable of organizing than the Zakharchenko and Tymofeyev team. Even those aspects that seemed on track began to collapse. For instance, it came out very recently that the workers at Teplytsi Donbasu [Donbas Hothouses] simply “forgot” to collect the harvest and left everything rotting in the fields. That led to a shortage of vegetables in DNR and prices on what there is have started to climb. Typically any economic problems in ORDiLO were blamed on dirty tricks played by Ukraine: everything was due to the economic blockade and military actions. But today the situation is so plain stupid that Ukrainians can no longer be blamed for it. Back in April 2018, the site of the “DNR Council of Ministers” claimed that Teplytsi Donbasu would provide 70-80% of all the vegetables for the “republic.” In December, the same site announced the actual harvest figures. “An inspection of the territory of the hothouse complex revealed that a majority of the vegetables were left in the fields and were no longer harvestable. About 2.8 hectares [7 acres] of sweet peppers remained unpicked, 2.0 hectares of green and rotunda bell peppers were not harvested, and 0.4 hectares of Chinese cabbage were unharvested. According to the confirmation of seeds and seeding materials used, the normal term for seeding Chinese cabbage was not adhered to. Despite good weather conditions, harvesting was not carried out in October. The result was that the cabbage froze and was attacked by pests. It is not suitable for sale to the public. The crop could have been more than 26 tonnes, although only 8.417 t was actually harvested according to data from DP Teplytsi Donbasu. Thus, the approximate volume of harvest that remains in the fields and could have all been sold on the republic’s markets is 17.6 t,” states the site. Social nets are already full of jokes about how Denys Pushylin learned to shred cabbage at MMM [a notorious pyramidal scheme from the 1990s], not how to grow it, which is why he can’t organize harvesting. In fact, the situation is anything but funny. If even the harvesting of vegetables remains an unresolved problem, what can be expected in more technical areas? There is little official information about industrial conditions in DNR, and they try not to advertise the size of the problem, so most of what can be picked up on the internet is rumor. For instance, the residents of Horlivka talk about the preservation of the Styrol chemical plant and layoffs. How true this information might be is not very clear, but the lack of positive news about work in Horlivka’s main employer suggests that the situation is bad. Of course, DNR/LNR propaganda typically trumpets the least little success in every available source. Other ambitious projects that were earlier hot topics on local media have also gone quiet. For instance, the “Donetskiy” tramway that Zakharchenko and Tymofeyev promised to organize the manufacture of in the city was quietly buried after Zakharchenko & Co. were removed. The only tram that was actually built turned out to be nothing more than a repaired old Czechoslovakian “Tatra.” In the end, it didn’t end up being launched on a run because of problems with the brakes and the local press is now forbidden to bring up this flop. Only anonymous bloggers dare to discuss it. 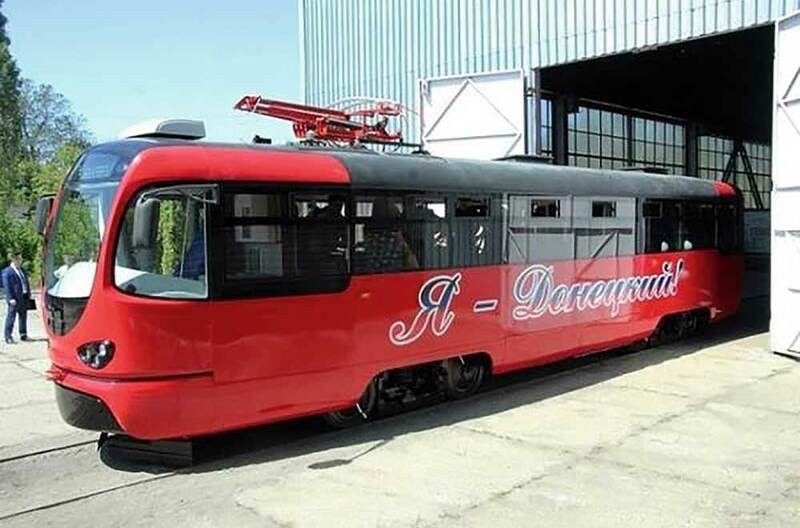 “The first tram wasn’t allowed to go into operation because it lacked brakes, the second one died at an even earlier stage and will probably never be assembled for lack of parts,” was the explanation given for the sad fate of the Donetsk tramway by blogger Donetsk Aborigine on his telegram channel. The real power in DNR occupied territory after the killing of Zakharchenko went to people who were once with Ukrainian oligarch Serhiy Kurchenko, meaning actually those who stood behind him. Today, he controls all the industry in ORDiLO through his company, Vneshtorgservis, meaning external trade services. After Zakharchenko was eliminated, the post of premier was established in DNR, and former Vneshtorgservis employee Oleksandr Ananchenko was appointed to the position. Ananchenko is now mainly in charge of the economy, while 37 year-old Pushylin is more of a figurehead. The real state of the economy in LNR is even less well known. Unlike Donetsk, there is no evidence of any kind of activity, even an underground opposition. Still, the occasional bit of information makes its way into the press. In November, the former Ukrainian MP and separatist Oleh Tsariov, who supports LNR and DNR, published a letter from LNR in his blog in which the anonymous author described the economic situation in the occupied part of Luhansk Oblast. The result of this economic decline has led to a crazy situation where some residents of ORDiLO are migrating to equally impoverished and unrecognized Abkhazia for work just to feed their families. A report on “gastarbeiters” from DNR and LNR was recently published in Russia’s Komsomolskaya Pravda. People who went to Abkhazia to pick mandarins complained that they were being offered only RUB 5,000 a month in ORDiLO, while in Abkhazia heavy work paid as much as RUB 1,000 a day. All these economic difficulties were compounded by a serious rise in food prices in the last month, moreover an increase that appears to have no objective basis. For instance, in some places 10 eggs cost as much as RUB 80 – expensive even by Kyiv standards, where 10 eggs cost UAH 27 at a supermarket and UAH 22-24 at an open market, which is RUB 56-61. Where do such high prices come from, given the miserably low wages in ORDiLO? No one has an answer. But the most popular guess is that the militants are taking “tribute” from wholesalers, taking advantage of the fact that locals have no rights and can’t do anything to protest abuse. Prices for poultry and vegetables have also skyrocketed and some have simply disappeared from store shelves, like it was in 2014 when the conflict in the Donbas disrupted supply chains. For instance, flour deliveries are being disrupted in Donetsk lately. All these problems have led supporters of DNR to gradually develop a nostalgic attitude towards Zakharchenko’s “strong hand.” Some residents of ORDiLO have even started writing in social nets that things were not so chaotic when he was around, that prices were stable, that vegetables weren’t left to rot in the fields, and so on. Meanwhile, people have no respect for Russia’s new point man, Denys Pushylin, and blame all their problems on his poor management. Of course, it’s clear that the roots of ORDiLO’s problems are not in the person of the latest “Gauleiter,” who is always restricted severely and forced to coordinate all his actions with the Kremlin, but in the situation that left parts of Donetsk and Luhansk Oblast in the hands of the militants in the first place. That this territory would deteriorate and decline was obvious from the very start to anyone who had even a smattering of understanding of economics. And 2018 saw the continuation of the same negative processes that had been going on all the previous years since the territories were taken over by illegal armed groups. The squeezing of Ukrainian industrial enterprises, the lack of laws and courts, the rupture of economic links with other regions of Ukraine, the powerlessness of the local population, and the violence against any and every person who disagreed with what was going on – all condemned ORDiLO to a slow but inevitable extinction. And as long as the territories continue under the current conditions, things will only get worse. Given all this, it’s not hard to predict what will happen with the Donbas in 2019. If there is no progress in reintegrating it into Ukraine – and this depends in part on the results of the upcoming elections in Ukraine and a slew of external factors – ORDiLO’s plunge into the abyss of neglect and impoverishment will continue.